Despite reports that they will live together after their divorce, Ben Affleck and Jennifer Garner have quietly put their Pacific Palisades compound on the market, with an asking price in the neighborhood of $45 million. Situated on 3 acres of land, the sprawling 8,798 square foot home features 5 bedrooms, 8 bathrooms, 4 fireplaces, and what the listing information in 2009 called, ‘the best projection room in L.A.’. In addition to the multi-winged main house, the self-contained compound also includes a separate building with an office, art studio, gym and two bathrooms as well as a guest house, hidden underneath the back yard lawn. The underground space includes two suites for guests or staff, 3 bathrooms, a billiard room, craft room and views of the Pacific Ocean. Amenities include a half-court basketball court, solar panels and an amoeba shaped swimming pool. In June moving trucks were spotted at the house twice in one week. During that time it was reported that the pair was just remodeling. Just 4 days later, they announced they were divorcing. Initially a source had revealed that Ben and Jen had planned to live on the property together, but that likely changed after news of Ben’s relationship with the nanny came to light. In recent weeks, however, the couple has been photographed spending time together at church, and at the market. 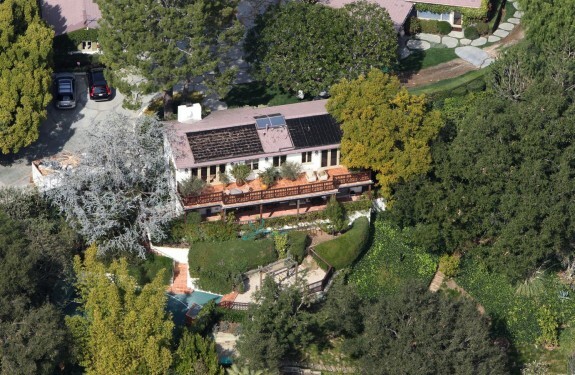 Ben and Jen purchased the 75-year-old home in March of 2009 for $17.55 million from producer Brian Grazer. Cristiano Ronaldo Celebrates His Leading Goal Scorer Award With His Family!